This time for a lovely breakfast. Here I am sharing a delicious recipe of "Alloo ka parathas" which can be served with curd and pickles. Sieve the flours with the salt. Add ghee and mix well. Add enough water and make semi-soft dough. Mash the potatoes and add the remaining ingredients and mix well. Knead the dough and divide into 5 equal portions. Roll out one portion of the dough into a circle of about 5" diameter. Divide the prepared stuffing in 5 equal portions. Place one portion of the prepared stuffing in the center of the dough circle. Bring together all the sides in the center and seal it tightly. Roll out again into a circle of about 5" diameter with the help of a little flour. 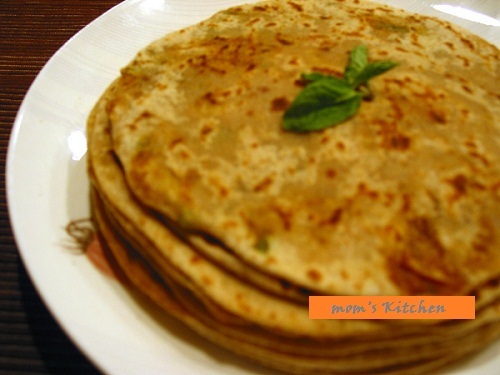 Cook these parathas on a tava (griddle), using a little ghee until both sides are golden brown. Serve hot with curd and pickles.